The Adobe Edge Animate CC Timeline is a crucial part of the software. The Timeline is where you determine when different actions take place and which elements are affected. You can find the Timeline at the bottom of the screen. An important set of tools are located directly after the Play controls — these are where you can set the Keyframes mode, set the Auto-Transition mode, and you can also toggle the Pin and set the Easing attribute. These tools are shown in this figure. 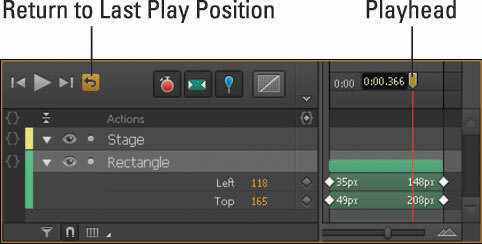 Adobe Edge Animate CC uses keyframes for animations. Keyframes appear as white diamonds in the Timeline. The green horizontal bars in this figure represent the transitions (animation sequences) between keyframes for a rectangle element that moves from the left corner to the bottom-right corner over a period of 5 seconds. That’s a lot of information, and you can find it all within the Timeline and keyframe. Keyframes: You can toggle them on or off if you want or don’t want Edge Animate to create keyframes automatically for you while you’re creating your composition. Auto-Transition: You can toggle this feature on or off if you want or don’t want Edge Animate to create animation sequences automatically when you move elements around the Stage. Playhead and Pin: When it comes time to start animating, make sure the Pin is toggled on, otherwise Edge Animate won’t create animation sequences. Easing: You may not necessarily call this a toggle, but you can choose your preferred Easing attributes; your choices affect the way Edge Animate brings your elements to life.